Do you believe everything you hear about US immigration? At VisaPlace, we often encounter hopefuls looking to immigrate to the United States who have blindly followed bad advice from so-called “professionals”, only to find they’ve made serious errors that may have messed up their case for good. 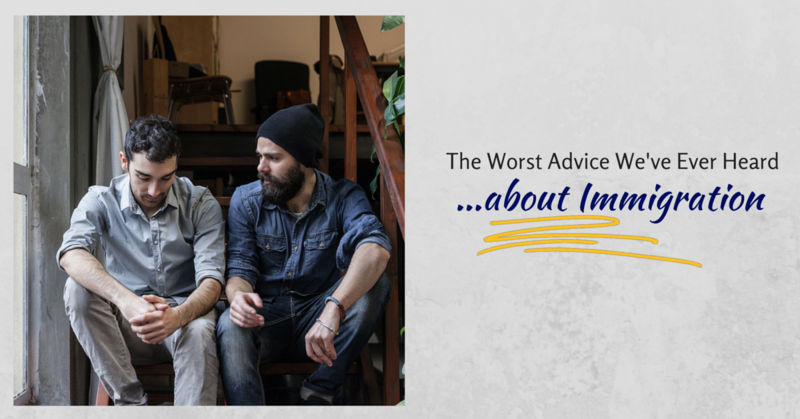 From our combined experiences of providing professional immigration services, we’ve put together a list of some of the worst advice we’ve ever heard about immigration. Many people want the benefit of immigration services, but aren’t prepared to pay for it. Therefore, they end up going for the cheapest option. This brings us to our first point; cheaper isn’t always better. For instance, many US employers go the recruiter route when it comes to employing foreign nationals, and they automatically opt for the lowest bids in order to cut down on costs. These recruiters will in turn opt for the cheapest possible immigration firms leading to petitions being denied and employees still waiting to enter the country up to a year later. Some believe that the only job of an immigration consultant is to fill out paperwork and ensure it reaches the government within the appropriate deadlines. This is not the case; in fact, there’s a lot more to it than that. The first attorney hadn’t been aware of all the facts, otherwise he could have obtained permanent residency for the client as an outstanding professor, therefore allowing his son to immigrate as a derivative beneficiary. Another mistake is blindly trusting large immigration firms because “they must be good”. If an immigration consultant gives you doubtful advice that you’re really not sure of, we always recommend seeking a second opinion. Back in 2012, a New Zealand immigration adviser was ordered to pay out $21,000 after issuing bad advice to clients. According to one immigration adviser authority register, Barry Smedts, the case showed just how important it is for consumers to do their homework on an immigration adviser. This means checking the internet for reviews and looking into a company’s background to see if there are any red flags. How long have they been in business? Has the director/founder ever been in any legal trouble? Have they previously practiced under a different name? Have You Followed Bad Immigration Advice? Bad immigration advice can cost you the chance to immigrate to a different country. If you’re interested in immigration to Canada or the United States, you should do your homework before settling for a particular immigration lawyer. If you have received wrong or bad immigration advice before, the experts at VisaPlace can help. We have over 30 years of combined experience and have helped over 50,000 clients successfully immigrate to North America. Plus, we can identify bad advice as soon as we hear it. Start your free immigration assessment, and we’ll get back to you in 24 hours to discuss your eligibility and options.